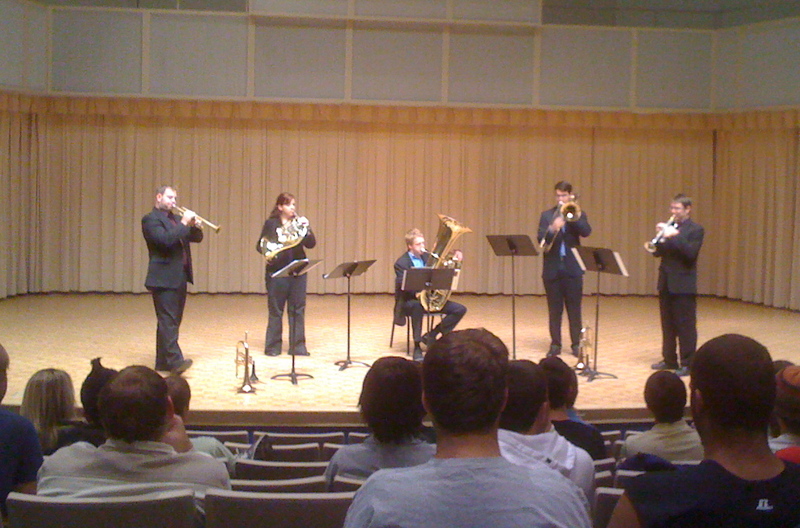 Last Friday, November 12, I got the opportunity to attend a masterclass given by the Mirari Brass Quintet at Western Carolina University. They opened with a composition by one of their trumpet players, Alex Noppe, and closed with his arrangement of Charles Mingus’s Goodbye Porkpie Hat. Alex has made this arrangement available for free on their official web site, so be sure to go grab it! Although I had to miss their performance later that evening, they played extremely well at the masterclass and I’m sorry I couldn’t attend. They also had some great things to say about overcoming performance anxiety, which I thought I’d share here. Each member of the quintet took some time to speak briefly about strategies they’ve personally adopted that help them with feeling nervous. Hornist Jessie Thoman spoke first. One thing she said that I found particularly insightful was that, “Fearlessness is not lack of fear, but the realization that there’s something more important than being nervous.” This theme, that everyone gets nervous and coping with that fear is about putting your fear into perspective, was a common thread for all five of the musicians. Jessie also spoke of the language we use to ourselves and to keep our internal dialogue positive. Alex Noppe, trumpet, spoke on the importance of practicing performance. He mentioned that he has his students perform for each other regularly and practice going through the motions of presenting their practice the same way they perform. Another important point Alex made was that one should practice looking like a professional, including not reacting to mistakes that are made. It’s always a temptation to grimace or otherwise react to a mistake in our practice, but we’re building habits by doing so. It’s important to practice not making a physical reaction to our mistakes so that we don’t habitually do so during the concert. Tubist Glen Dimick emphasized bringing the excessive emotional intensity of the performance down a notch as a strategy for dealing with stage fright and not letting the energy go over the top. He also reinforced that it’s important to remember the big picture of musical communication and not getting bogged down on the details that may or may not go well. John Grodrian, the group’s trombonist, mentioned that it’s useful to expect to get nervous when performing. Sometimes he’ll do some jumping jacks before performing to intentionally get his heart rate up in advance. Eddie Ludema, who is the other trumpet player, also emphasized focusing on communication over trying to squash nerves. He told a story about studying music in Germany and having the opportunity to see a beautiful cathedral every day. On his last day before returning to the U.S. he spent some time looking at the cathedral and realizing that it might the last time he ever saw it. Now, he uses this memory as a story that he communicates to the audience when he plays certain pieces. Eddie finds that working on communicating the emotions he feels when recalling the last time he saw this cathedral puts his nerves into perspective and helps him perform better. Hornist Jessie wrapped up the masterclass by encouraging everyone to try out an exercise she likes to do. Jessie mentioned that she will write out an inspiration sheet that she places on her music stand to read just before performing and periodically throughout the concert. It includes things like, “The audience wants you to play well,” “Play for [insert name here], and “Breathe!” Jessie challenged everyone to put together their own inspiration sheet and at the next rehearsal to write down something positive you can bring to the rehearsal (energy, expression, etc.) and something you want to improve on (staying positive, etc.). It was an inspiring and educational masterclass and I’ve heard great things about their concert later that night. They are just starting their tour, so if you’re in Conway, SC, Dahlonega, GA, Atlanta, GA over the next week you can catch them yourself. Their calendar is available on their web site (along with some sound files of their playing) if you want to keep an eye out for when they might be in your area. Great post Dave. Alex Noppe just joined our faculty at ULM this year on trumpet, and we are thrilled to have him. Very cool! I loved his writing, as well as his playing. Seems like a very personable guy, too. Hi Dave! Very nice blog! You have a lot of great info here, and I was thrilled to see your kind words about our masterclass published in the Cloud! Thanks and keep in touch! Thanks for stopping by, Eddie. I enjoyed the master class and wish I could have stayed around for the concert and hang. Be sure to let me know when you tour our neck of the woods again!